This tree is Symbolic of Fertility and New Beginnings and is closely associated with the waxing phase of the Moon and the Maiden aspect of the triple Goddess. 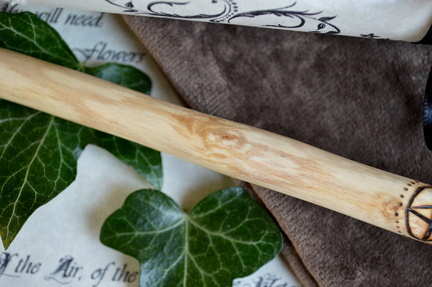 This delightful Silver Birch wand measures just over 11 1/2" (29.5cm) in length with a thickness of 5/8" (1.5cm) at its widest point which tapers to a gentle point. We have retained a section of bark on this wand to form a delightful Hilt. The Bark has rich tones of Morello Cherry red witch Lichen green markings and soft copper coloured flecks. The main body has a base colour of pale cream with delightful markings in fawn and cinnamon. We have also pyrographed a Pentacle design at the top of the Hilt. 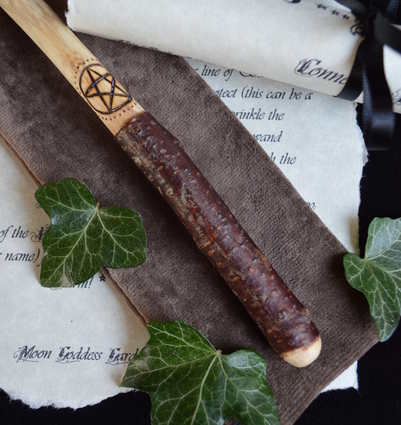 This wand would be well suited to all forms of Protective and Cleansing Magic and would be ideal as an every day wand!